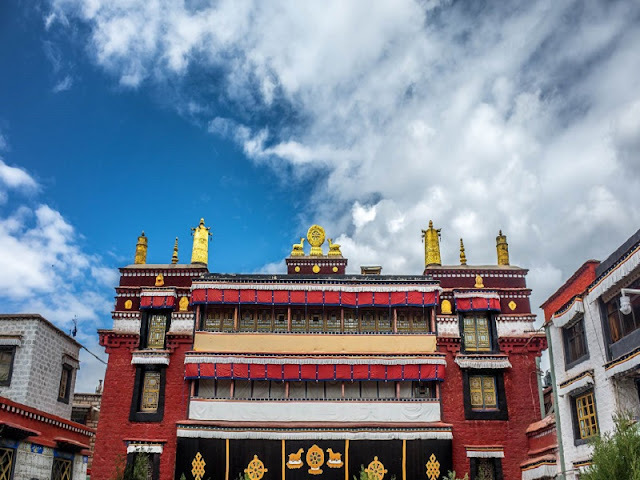 As a holy place in Lhasa Tibet, Ramoche Temple is located to the north of Barkhor Street at a distance of about 500 meters. 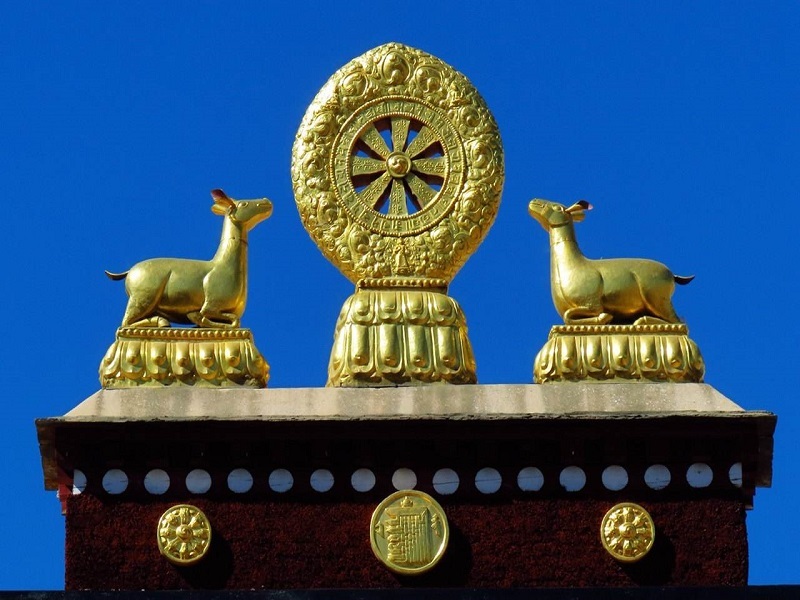 It had been built from 641 AD by the order of Princess Wencheng who is the wife of the great Tubo King Songtsen Gampo. Ramoche Temple and Jokhang Temple are known as twins from the beginning. 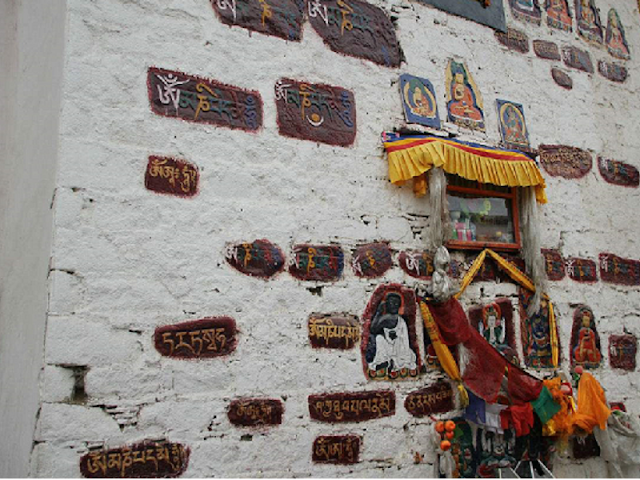 With an area of about 4,000 square meters in total, Ramoche Temple is one of the most ancient temples in Tibet. 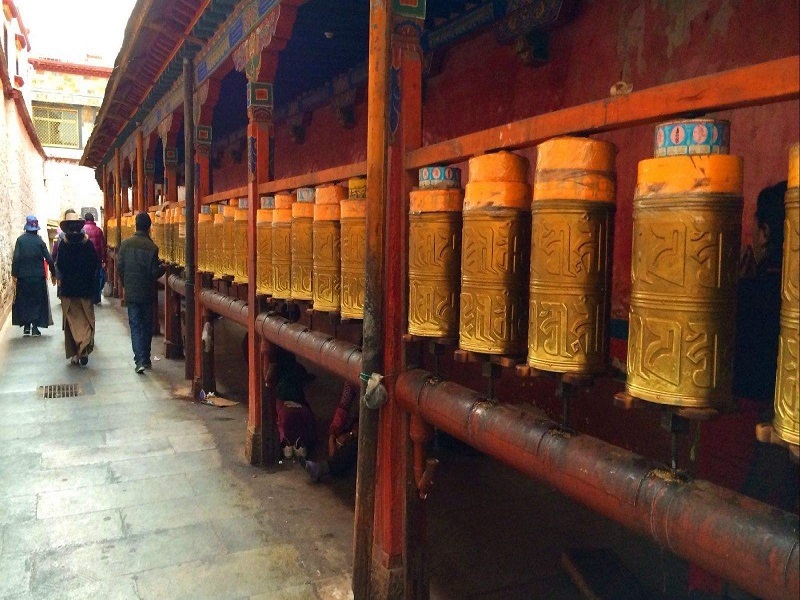 It had been designed with a mixed style of Han culture and Tibetan culture. When you enter this historical remains, you will find a beautiful courtyard lies in front of you. Keep walking on and you will see the main shrine with a gatehouse and a cloister for the pilgrims. The gatehouse is a wonderful building with three storeys. The ground floor is a spacious hall with 10 pillars, which diameter is about 0.8 meters. Every pillar is surrounded by three cupreous hoops with petal patterns carved on its surface. The foremost one is embossed with the gem, square helix, and the Brilliant Mantra of Six Words. There are several beautiful frescoes at the end of the room such as the Four Heavenly Guardians, the six great divisions in the wheel of karma and Elysian Fields. The top of the gatehouse is embellished with golden tiles, this made the roof spectacular and could be seen from any position of Lhasa City. Ramoche Temple is most famous for a life-size statue of Shakyamuni Buddha at age 8. There are a lot of precious treasures in this ancient site like images of the Buddha and Thangka. 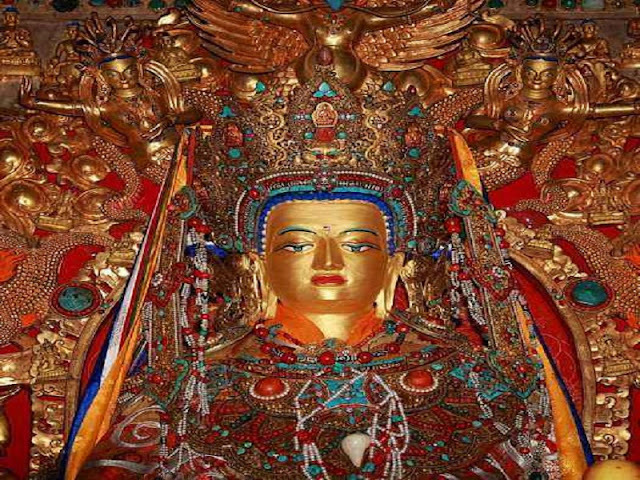 Besides, a statue of Bodhisattva decorated with a great many of gems could be a gift passed down for hundreds of years. According to legend, when Princess Wencheng come into Tibet for marriage, the carriage used for carrying the statue of Shakyamuni Buddha was trapped in the sand when they got to the position of Ramoche Temple. As a wise woman and a devout Buddhist, Wencheng calculated that the place is the seat of the Dragon King's palace through divination. So she made a decision to build a monastery there to keep the statue of Buddha to suppress the dragon and make Tibet more prosperous. This precursor of Ramoche Temple started to build and finished at the same time with Jokhang Temple. The temple faces toward the east to show the memory of the princess's hometown. Ramoche Temple has been damaged by fire many times in the past centuries. Most of the structures there were rebuilt, only the ground floor of the main hall is the remains of the past. The temple was destroyed in the Great Cultural Revolution. Fortunately, due to the government's support, Ramoche Temple revived by a series of reconstruction Ramoche was appraised as a nation-wide key cultural relics conservation unit by China's State Council in 2001. Ramoche Temple has been restored to its former brilliance and become more and more popular by world wide tourists in recent years. If you want an excellent Tibet tour, Ramoche is a place not to be missed.